Question of the Week: When Will the Economy Suffer the Consequences of the Fed’s Easy-Money Policy? This is an easy question for me to answer. To be honest, I have no idea. If I knew such things, I could time the market and I’d be rich beyond my wildest dreams and relaxing on the beach in the Cayman Islands instead of sitting in my kitchen in chilly Virginia. Heck, I don’t even know whether the Fed’s policy is wrong or just worrisome. It’s possible, after all, that the central bank has provided appropriate liquidity and it will soak it up at the right time. I don’t think that’s the case. I fear Bernanke is in over his head and that the Fed is engaging in the monetary version of Keynesian economics. And if that’s true, something bad will happen at some point. If there’s too much liquidity out there, it presumably will show up at some point as either rising prices or an asset bubble. Then again, we know banks are keeping more than $1 trillion of excess reserves parked at the Fed and maybe it will stay that way forever. In which case the private sector is inadvertently protecting us from bad monetary policy. Thomas Sowell has suggested that something like this is happening. I can say for sure is that we wouldn’t have to worry if we were in a libertarian fantasy world and the private sector was responsible for money. You may think that sounds crazy, but that’s the way it used to be, as explained in this short video. John Stossel has made the same point about competing market-based currencies. And if you want to see how well money has maintained its value since the Federal Reserve took over, this link has an excellent video. P.S. I often get asked about the gold standard. It’s good in theory, but the real issue is whether governments can be trusted to operate it prudently and honestly. P.P.S. 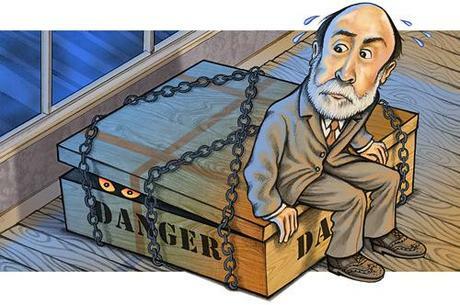 Since Christmas is just two days away, we can all wonder whether we will get this present from Ben Bernanke. And if you still have some last-minute shopping to do, here’s a Bernanke t-shirt for your liberal friends. P.P.P.S. For some laughs, check out Ben Bernanke’s Facebook page. Rather learn a new way to think. Even if one accepts some value for Keynesianism, in being able to free an economy from the supposedly capricious deadlocks of free markets (a dubious assumption, but that is another story), Keynesian government spending and the money printing that enables it cannot be perpetual policy. But that is what HopNChange is. Hope in prosperity through irreversible government expansion which is, for now, being financed through the gimmicks of printing money, ie dilute savings. The fed is financing the disincentives to production of HopNchange into wretched economic decline. The fed is slowly diluting savings to finance borrowers and government expansion. How long will this last and how strong will the total compound dilution be? Unknown. Likely, Bernanke does not know either. Obama hopes forever. But the dilution of savings (ie the dilution of delayed gratification) is a lesson that will stay with the citizens for a long time to come. So the short term Keynesian gimmicks will come at the expense of even fewer savings for a long time to come. You see, America has a too much saving problem if you can believe it. Foreigners will not finance America’s turn to slower growth collectivism forever. Especially as their growing economies start providing ever more alternatives to American investment and demotivated Americans become unwilling to produce internationally competitive products. As welfare incentives to complacency and mediocrity take root in America, International confidence in the American ability to repay will be questioned and the situation could easily and quickly nosedive. In my view, that is the most likely scenario as to when a temporary [ha ha yes temporary] VAT will hit the fan. That is when the last nail in the coffin of American prosperity will be hammered. But just because the final nail has not been set yet, does not mean that the situation is still reversible. American immigrants (present and past) have finally killed the American dream they and/or their ancestors came here for. The western world voter lemmings and the leaders they vote for are in a delusional race with each other as to who will decline faster. Europe is quite a bit ahead but America is also irreversibly into the vortex of HopNChange. on December 23, 2012 at 8:37 pm Stephan F.
Now, it’s no problem at all keeping roughly half the population in-line believing in their constant market manipulations, interventions and malfeasance, because those fine folks naturally are the beneficiaries of this long running con game (this includes all gov’t employees, unions, welfare recips, etc, etc ad nauseum – you should know the list very well by now, and if you don’t, I feel sorry for you). No, it’s that other pesky half who are the primary victims of this swindle that are finally waking up to this greatest of all-time frauds. Those are the ones the Fed is aiming at with their constant charade of purporting an expertise they do not possess (sort of like many of those in the medical profession, but that’s a topic for another day). So what to do about this? Hmmm. Oh yes. If you haven’t already contacted both your senators & congressman by now asking them to endorse Ron Paul’s “Federal Reserve Transparency Act of 2012″, then Shame – On – You. If you have, I offer a tip of my hat. The American people’s plan for maintaining top worldwide prosperity is more taxes, more regulation, more programs to help insulate a majority of people from the consequences of mediocrity. As such, it is a systematic plan to reduce incentives to remaining most productive per capita country in the world (save a handful of niche countries that are small specs on the map- for now). Against this fundamental backdrop, macro-economic gimmicks to fool people into producing at levels needed to maintain top worldwide competitiveness and prosperity, will simply fail. Not only that, but macro-manipulation attempts to go against this fundamental reality of descent into lower incentives to produce, will further distort reality and make the inevitable correction more turbulent. With fundamental incentives to produce declining, the fed can probably fool a few people to produce for a while, and it can even fool most people to produce a few times (what is happening now probably). But it cannot fool most people most of the time into producing, as production, and especially exceptional production becomes harder (with an unmotivated workforce in a an ever more regulated environment) as well as clauses that increasingly prevent one from enjoying the fruits of his/her labor by, for example, forcing them to reduce their carbon footprint. People will learn the lesson that production does not pay, even if they learn so empirically, without understanding the fundamental causes: Reduction of incentives to exceptional production. With the institutionalized reduction of incentives now firmly rooted, fed policies only add distraction and, likely, even more distortion that delays inevitable and ever more painful correction back to reality. With lower incentives to produce a lower growth trendline is certain. The fractal behavior of the day to day or month to month or even year to year behavior of the economy is harder to predict. But in fifteen years, the relative prosperity standing of Americans on the world stage will have dropped. A Euro-like growth trendline of even two percent in a world that is growing by five, will bring systemic relative decline across the board. The American 99%, now in the worldwide top 10% will find itself much closer to the true worldwide average. It will be the predictable consequence of Americans adopting the class-warfare and central planning natural human tendencies that are so prevalent in the rest of the world. Having stepped on the same banana peel, it will be impossible for Americans to maintain top prosperity. I’ll go on a limb and make a prediction: the economy will return to higher growth (say 3%) for a short period. But that will be the rebound from recession, which should typically have been 5% growth. Lemmings will sigh in relief, hoping that decline has been averted. But everything will have dropped to a lower norm, recessions deeper, rebounds weaker, all pointing to a lower growth trendline. The lower growth trendline will trigger more calls for redistribution help at the polls. Expect more HopNChange. The decline cycle will deepen. The poi t of no return has passed. Propelled to majoritarian status by 9/11 events, the American virtuous cycle fell to mandatory collectivism. American prosperity, unappreciated, R.I.P. Thanks for addressing this Dan. I’m still at a loss about what to do with my retirement funds, but at least now I’m in good company. Merry Christmas.